The SIRIUS Centre is hosted by the Department of Informatics at the University of Oslo. 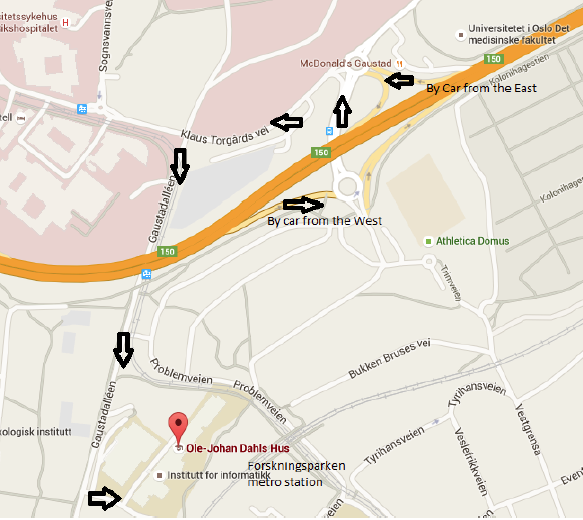 We are located on the 8th Floor of Ole-Johan Dahls hus, Gaustadaléen 23B, 0373 Oslo. Take the lift in Staircase D (North End of Building) up the 8th floor and ring your contact on the intercom to gain admission. Take the Airport Express Train to Oslo Central (Oslo S). Follow the signs to the Metro and then follow the instructions for from Oslo Central Station. Take the westbound metro (T-bane) from Jernbanetorget station on line 4 (Vestli) or line 5 (Sognsvann or Ringen via Majorstuen). Get off at Forskningsparken station – 5th stop, previous stop is Blindern. Walk down the steps, turn left under the metro line and the building is the large black building on the left hand side of the street. Easiest access to the Centre is from the Oslo ring road: Ring 3 Store ringvei at the exit towards the Rikshospitalet University Hospital. If you are coming from the west: turn left in both the first and the second roundabouts. Drive uphill and take the first exit to the left. You are now in Gaustadalleén, and Ole-Johan Dahls Building is on your left-hand side, approximately 500 metres further down the road. If you are coming from the east: follow the second exit after the Tåsen tunnel. Follow the second exit from the roundabout (slightly to the left). Drive uphill and take the first turn to the left. You are now in Gaustadalleén, and Ole-Johan Dahls Building is on your lefthand side, approximately 500 metres further down the road and first left. There is pay parking in the parking station under Forskningsparken (to the right) and you can also park with a visitors’ permit (available from us or from the Institute for Informatics reception) in the parking area for the Informatics building (to the left).